Lt. Col. Gerald Leyshock was commissioned as a police officer on February 11, 1980. After graduating from the Police Academy, he was assigned to the Eighth District and Narcotics Division. Lt. Col. Leyshock was promoted to the rank of Sergeant in September 1991. As a Sergeant he served in the Sixth and Eighth Districts as well as the Area III Detective Bureau. 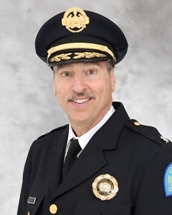 Lt. Col Leyshock was promoted to the rank of Lieutenant in December 2001 and commanded the Housing Authority Unit and the Community of Policing Unit. In February 2007, Lt. Col. Leyshock was promoted to Captain and served the Fourth District for 2 years and Third District for 3 years. Following his promotion to Major in January 2013, he commanded the South Patrol Division for several months and was then transferred to the Bureau of Community Policing as the Deputy Commander. While serving as the Deputy Commander of the Bureau of Community Policing he was again promoted to Lieutenant Colonel in July 2015, where he is still commanding the Bureau. As COmmander of the Bureau he oversees the Department's 6 patrol districts, DEA Task Force, Traffic Safety Unit, Aviation Unit, SWAT Unit, Public Transportation Unit, Nuisance/Problem Property Unit and Part Rangers. He aslo over sees the Bureau of Investigation Support Bureau which consists of: Homicide Division, Crimes Against Persons/Property, Child Abuse/Domestic Abuse Response Team, Juvenile Division, Circuit Attorney's Office Unit, Bombing & Arson and Fraud/Cyber Crimes Unit. On April 15th, 2018, Lt. Col. Leyshock was assigned to the South Patrol Area Station as Deputy Chief. On January 1st, 2019, Lt. Col. Leyshock was assigned to the Bureau of Community Policing as the Deputy Chief and presently holds that position. Throughtout his distinguished career at the Department, Lt. Col. Leyshock has received 12 Chief's Letter of Commendation honoring his skilled work in Law Enforcement. Lt. Leyshock received his Bachelor's Degree in Communications from University of Missouri, St. Louis(UMSL).